Oh man.... it smells like cookie dough. I take my first bite.... and then my second... and then my third. Yeah, somebody had fun when they built this flavor. It's definitely different. Currently attempting to resist the urge to dig down deep in to that "dark butter fudge" swirl (since there is none at the top of my pint). Hmm, I did just find a tiny piece of cookie dough.... searching for another. Two more tiny bits but nothing huge. The tough thing right now is that I'm waiting for something to happen.... but it's not. I get that it's cookie dough, but it's not bowling me over with flavor or chunks. Instead, it's trying to tease me. The base texture is fine as always, but I need a textural change to drive home the fact it's true chocolate chip cookie dough. Before cracking this pint open, I had visions of it tasting like the super sweet swirl in Blue Bunny's cookie dough ice cream, but that's not happening. This is subdued... oh so subdued. Even the fudge swirl seems like some wispy dry cocoa mixed in. Crud, I have psyched myself up way too much for this one. It's good, it's not bad, but I was sitting here ready for my brain to explode like it did with salted peanut caramel.... wait, wait, I finally found some cookie dough! Ok, now as a disclaimer, I should admit that I probably just ate at least half the pint. There are moments when you take a bite and if you slow down you will get this neat cookie dough flavor coming across... but I need more. I hate to play the mix-in card, but considering how I much I ate, I should have gotten more than one cookie dough chunk and four tiny bits. You can't taunt people like that. On Second Scoop: Since there is no point in endlessly digging for elusive cookie dough bits, I decided I would lightly snack on the rest of the pint. What that means is stealing 4 or 5 bites here and there to see how it hits me. Overall I do like this one. The smell and flavor remind me very much of (a quality) vanilla extract and brown sugar mixed together. I'd put this one with the likes of their Belgian milk chocolate flavor. It's nice and simple, but may not be something you want everyday, but hopefully you will enjoy it.... well, after you get over your frustration about the cookie dough chunks anyway. Final Note: I finished this one and found TWO more cookie dough balls. That's it. Nick's Thoughts: Just got my hands on this and all I can say is wow, that was lackluster. 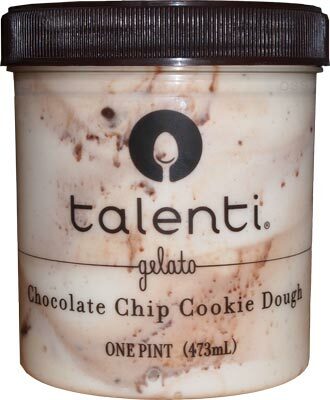 ‎I don't think I've ever had a cookie dough flavor I was so bored by. Everything tastes fine but nothing stands out or makes me want to buy this again. The problem here is the mix-ins. The cookie dough chunks are minimal and the fudge swirl does nothing for me. It's weird having such few cookie dough chunks without chocolate chips in the mix to add texture and flavor. The swirl adds flavor but lacks the added texture I want. 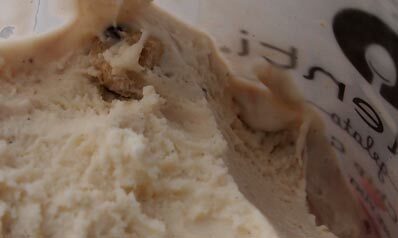 Far too many bites of this gelato are mix-in less and that's not what I want from a cookie dough flavor at all. None of the new gelato flavors have hit my area here. It's really a downer as I look every time I go to the store. I'm not a Talenti fan but even I was excited to hear about this new flavor because I have been waiting for a frozen dessert to have just chocolate chip cookie dough as the chunky mix-in and no added chocolate chips. And the fact that this is a vanilla bean gelato with a swirl instead of chocolate chips sounded even better. 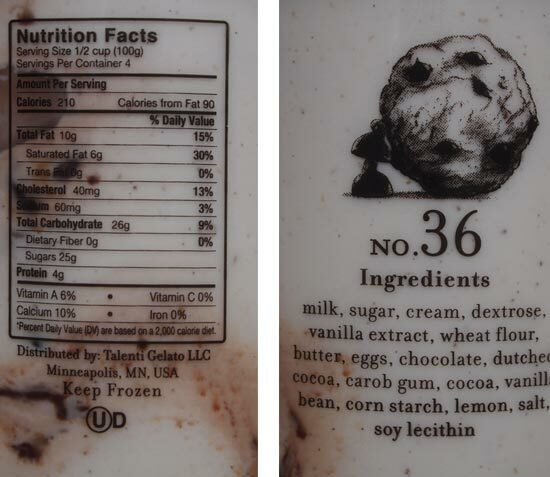 But with just a few cookie dough bits in your gelato, Talenti let us all down. Otherwise, this would have been a flavor that even I would have picked up which would have been saying a lot. @ The Toy Box, they haven't hit my area either. Really hoping that they will but the Talenti selection is tiny in my grocery store. Dubba, I get that Talenti is more subtle than B&J's with their mix ins but I think they need a little more. My last pint of caramel cookie had no caramel and barely any cookie bits. The choc chip cookie dough looks kind of disappointing. Bummer. Was kinda afraid of this exact review. While I think we all suspected that Chocolate Chip Cookie Dough would be a fine addition to the Talenti lineup, I think we also all had hopes that this would emerge as one of the elite Talenti flavors. I guess we can't really complain ... I mean, at the end of the day, a good flavor is good a good flavor, right? Nothing to sneeze at, for sure. Just think we were looking for, perhaps, another Caramel Apple Pie in terms of the "homerun" factor. I actually bought this the day before you reviewed it. I had high hopes as I've had great success with some of the other Talenti flavors and actually bypassed the new Salted Peanut one in favor of this since I haven't had a cookie dough ice cream in forever. It's very odd in that it's like they went for the ice cream being cookie dough flavored itself, but it just doesn't work for me. I do really like the fudge swirl and think that's an awesome idea instead of putting chips into the base which I never liked in other cookie doughs. Overall it's not bad, but it's nothing special and I doubt I'd pick it up again. what store did you purchase this from? I just had my first and last pint of it. There was not even one speck of cookie dough in mine. Severe disappointment. I bought one pint and it was great! It was loaded with cookie dough balls! Shi the never day I went back and got another pint, I was addicted because the quantity of cookie dough balls was almost in every other bite or two! A couple days ago I went and bought another pint because I was having a craving for cookie dough...I ate almost the whole point and not one speck of cookie dough! I took it back to the store and said that Talenti must have messed up, so they exchanged it and said to bring it back again if it didn't have any cookie dough! Here I sit, third pint in a row with not one tiniest little bit of cookie dough! I'm so disappointed! Hard to believe Cookie Dough could be a "new" flavor, but there are plenty of better options for when I need a cookie dough fix (or at least are cheaper without much quality difference). The cookie dough pieces are OK but rare (which seemed to be typical of the three Talenti flavors I tried) while the fudge reminded me of McDonalds (which I like but wasn't what I was expecting for this price), but the base didn't quite work; as others have said, I get that it's cookie dough (or it comes across that way), but something was just missing. Caramel Cookie Crunch is still on my list to try, but my expectations have been lowered. 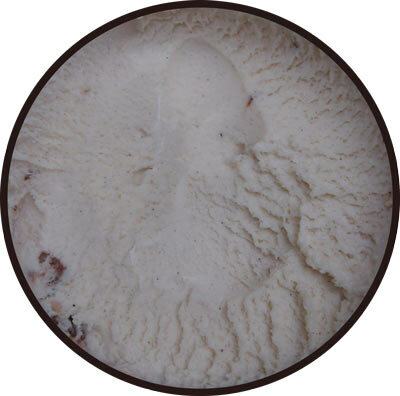 This seems to be a nice minded review of one of Talenti's misses. So many of this company's products are incredible, but not this one. 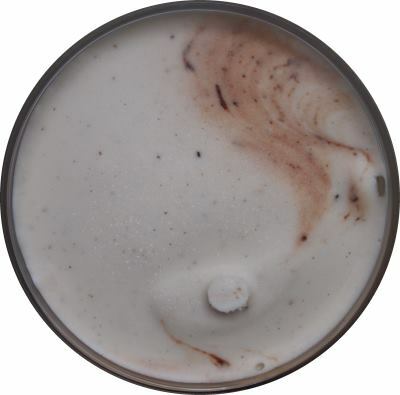 It is basically their Tahitian Vanilla Bean with not enough other stuff. A huge disappointment. Very disappointing flavor. If you're going to call it "cookie dough", it better have lots of cookie dough in it. Tastes more like "Cookie Vanilla" not cookie dough. Fail.